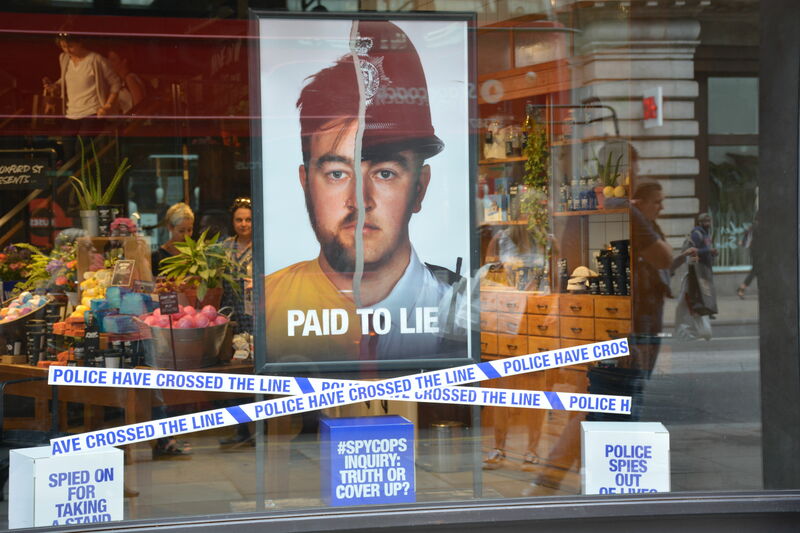 Thanks to Lush and their bold window campaign, tens of thousands of people have now learnt about the #spycops scandal, and the many ways in which these undercover police officers ‘crossed the line’. Along with the others whose lives were infiltrated, targeted by the #spycops due to their involvement in groups campaigning for change, we are calling for the truth about these abusive, intrusive, political policing units to be uncovered. The Undercover Policing Inquiry began in 2015, but three years later, those of us designated ‘Non State Core Participants’ are fast losing faith in the process. The current Chair, Mitting, has consistently put the interests of the police above those of their victims. He has granted complete anonymity to around a third of the Special Demonstration Squad (SDS) officers, and seems likely to grant it to an even higher number of those who worked for more recent units, like the National Public Order Intelligence Unit (NPOIU). Without even the cover names used by these officers, a high proportion of those they spied on will not be able to come forward with evidence, and so the Inquiry will be unable to truly judge the scale and extent of abuses committed. 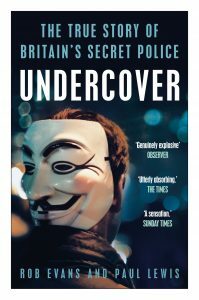 Ever since this Inquiry was established, we have campaigned for the full list of cover names to be revealed, along with the list of over 1000 groups known to have been spied on (this list was compiled as part of an earlier, internal, police investigation, Operation Herne, but its contents have never been made public). 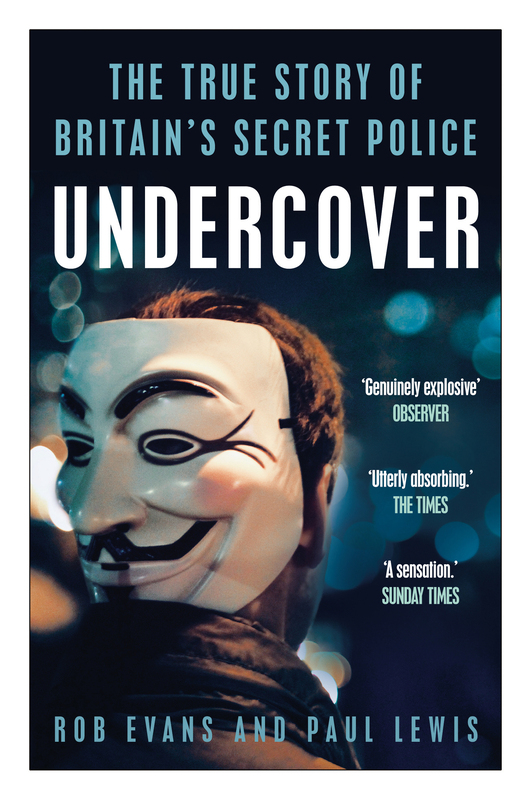 We have battled for more disclosure, in particular for the secret files that the police have undoubtedly created about each and every one of us (and thousands of other people who have engaged in some form of public protest over the past fifty years). How much information about us is on file? How many intimate details of our lives? 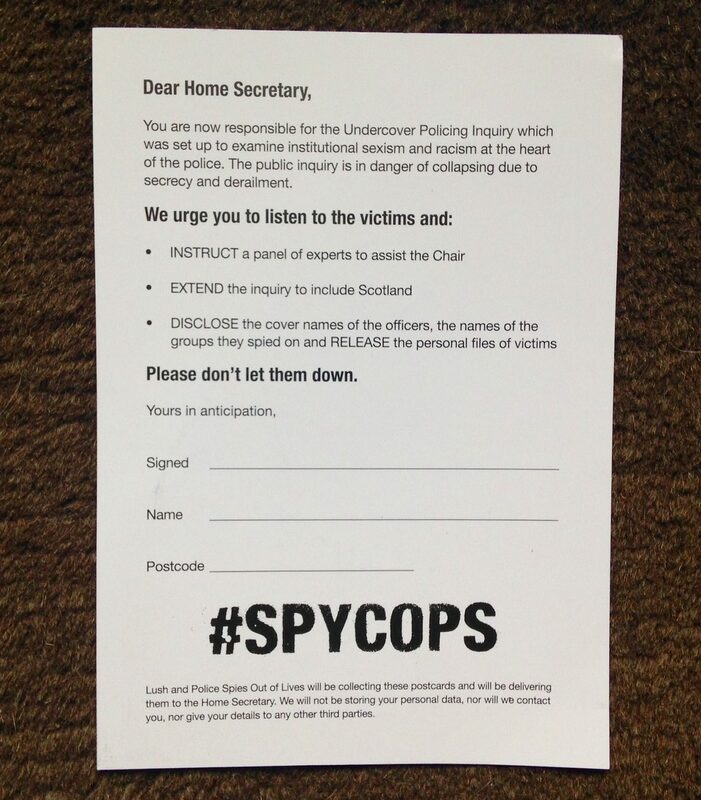 How much of what we told these spycops was reported back to their handlers and managers? Even the women who received this historic apology from the Metropolitan Police Service in November 2015 still haven’t been given this kind of information. The most that anyone has received are a few documents, some with inaccurately-labeled photographs and details, and no mention of the policemen that they had long-term intimate relationships with. Most of the women, and the young man known as ‘TBS‘, fathered by Bob Lambert, have had nothing at all, from the police or the Home Office. 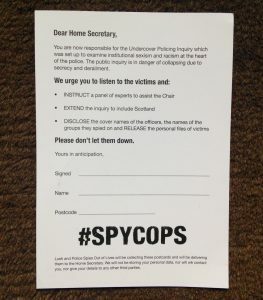 We know that the #spycops did not confine their activities to England and Wales – they frequently crossed borders using the false ID provided for them by the British State – and we believe that the Inquiry should also investigate what happened elsewhere. There are two legal cases due to be heard this summer, at the High Courts in Belfast and Edinburgh, about extending the UCPI to Northern Ireland and Scotland. 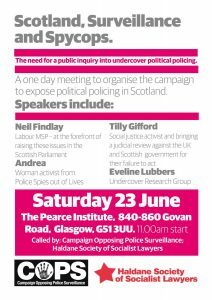 Scottish campaigners say that if this doesn’t happen, then the Scottish Government should set up a proper, independent, public, inquiry into undercover policing in Scotland. 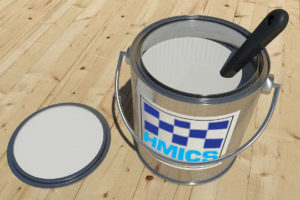 There is no point in more “white wash” exercises, like the universally criticised HMICS report. Our frustrations with the Inquiry have been growing steadily, as the extreme level of secrecy makes it impossible for us to participate in what is supposed to be an ‘open’, ‘transparent’ and ‘public’ process. Dozens of the victims took the drastic step of walking out of the UCPI hearing on 21st March, because we felt that there was no way we could meaningfully contribute, when Mitting repeatedly ignores our concerns and refuses to share what he knows with us. It’s not just those targeted by these spycops who are frustrated at the slow progress & the seeming shift towards almost-total secrecy. Whistle-blower Peter Francis joined the boycott of the next hearing, saying that even he felt unable to properly participate at this stage of the Inquiry. Even the children and former wives of undercover police officers have spoken out. We repeatedly asked Amber Rudd to meet us, and take action, when she was Home Secretary. She did not make the time to do so. We sent the same request to Sajid Javid on his very first day in office, & again three weeks later, just before the Lush campaign was launched. He inherited this Inquiry from his predecessors at the Home Office (Amber Rudd and Theresa May) and its future is now his responsibility. We’re looking to him to intervene and make changes, & ensure that it doesn’t end in abject failure (like the 18 internal police inquiries that preceded this ‘public’ one). Rather than meeting with the victims, or even bothering to reply to the letters from our lawyers, Javid took to Twitter to denounce our campaign & tell us it’s “not a responsible way to make a point”. What is a ‘responsible way to make a point’, Mr Javid? One thing that Lush is helping us do is collect postcards, addressed to the Home Secretary, asking him to take action, and reminding him that this inquiry was set up to investigate, publicly, the institutional sexism and racism of the police, and the many forms of misconduct perpetrated by the #spycops. After a short break, the campaign went back up in Lush’s windows last week, and is still running now. If you’re able to visit, and tell the staff how much we appreciate Lush’s support, please do. If you don’t have time to visit your nearest Lush shop, you can sign the petition online. 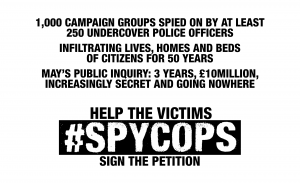 Thousands of people have added their name in the last week, calling on Sajid to do the right thing, and ensure that the #spycops’ abuses are not swept under the carpet. Take a badge and wear it in solidarity with the victims of these intrusive, abusive political policing units – spread the word and let people know the extent of these abuses. 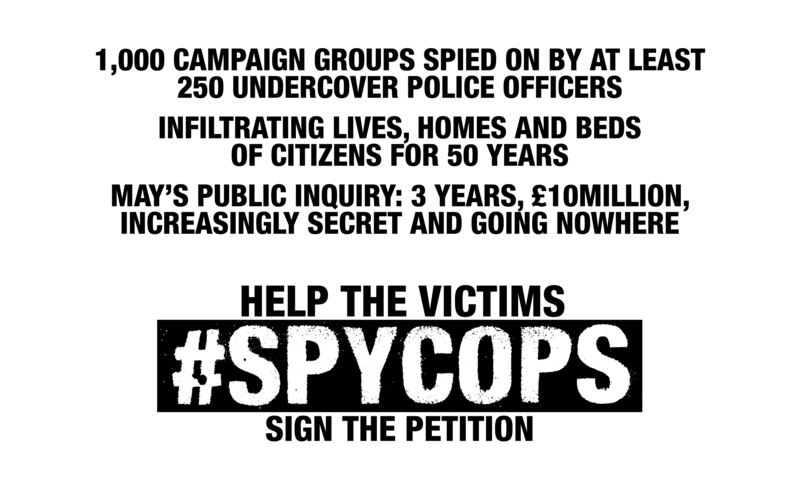 Tell your friends and family about the #spycops. Sign up to receive regular news updates from the campaign groups involved. 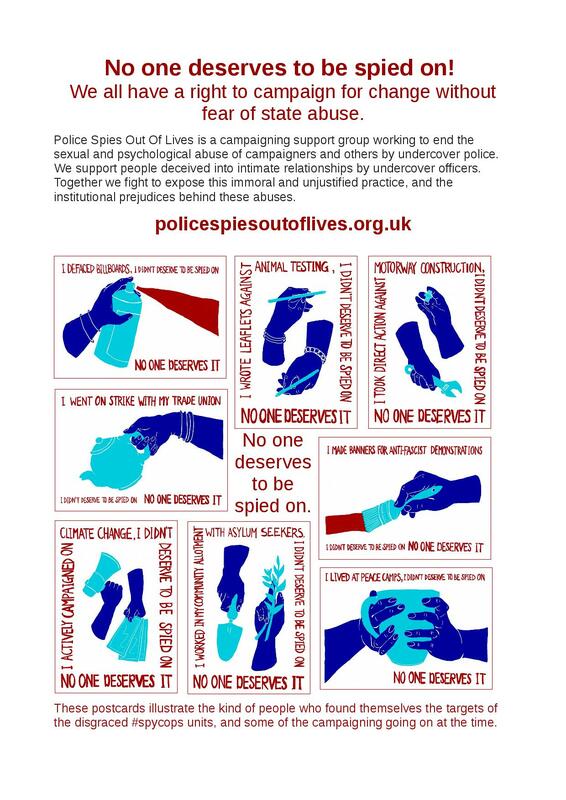 Follow @copscampaign and @out_of_lives & the #spycops hashtag on Twitter. Learn more from the Undercover Research Group, including the excellent and very informative ‘Was my friend a spycop?‘ pamphlet. 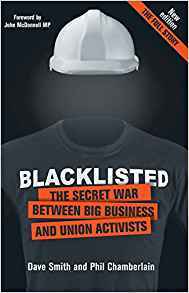 Get hold of books like ‘Undercover‘, by Rob Evans and Paul Lewis, and ‘Blacklisted’, by Dave Smith and Phil Chamberlain, from an independent bookshop (check out the ARB). Ask your local library to stock them too, so these shocking stories can be read by more people. If you’re a member of a trade union, local group or community organisation, ask the others if they would like to affiliate to the Campaign Opposing Police Surveillance – more info here. 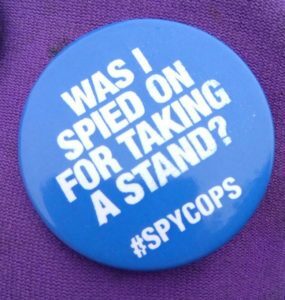 If you’re on Facebook, join the #spycops info group. Buy a set of our ‘No one deserves to be spied on’ postcards. 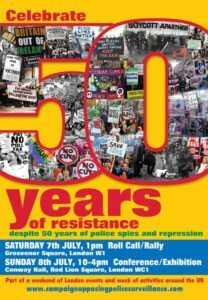 Come along to events like the ‘50 Years of Resistance‘ weekend in July. Organise your own events, and get in touch with us if you’d like someone to come along and speak about the campaign. 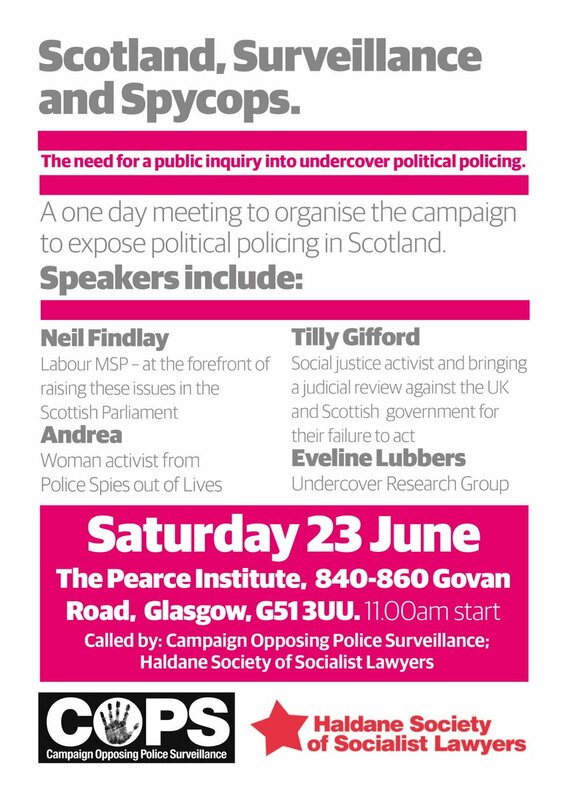 If you’re in Scotland, come along to learn more & link up with others who may have been spied on, at this event in Govan on Sat 23rd June: ‘Scotland, Surveillance & Spycops‘.